Doug Beyer gave us the last Legendary creature out of Rise of the Eldrazi, and boy will it make an impact when it hits play. You’re a sick, sick person. Activated abilities of creatures your opponents control can’t be activated. So, Linvala shuts down a huge majority of creatures. Remember that triggered abilities have the words, “At” “When” and “Whenever” and Linvala doesn’t do anything about that. But why would you pick her as your General? Yes, in certain play circles there are combos that require activated abilities (actually, change certain to most), so she will be a great part to any deck. Yes, she’s a really great card, but as your General? Maybe that’s a little overkill. Yes, White control decks can be good and certain shut down decks, but maybe this is a little much. Having her in your deck against other decks is not so much a jerk thing, but building up defenses to shut down your opponents decks. There’s not a whole lot that combos with her (Doug suggested turning all your opponent’s lands into creatures so they can’t tap for mana). If you want to do that, you’re gonna have to play a different color than White, which means you need to go in another color. Final Word: Yes, she’ll see play. While most likely she won’t be a General unless you need to teach your playgroup a lesson, she will see play in decks she can go in. Doran will love her, Crovax will certainly use her, and other Generals will be glad to draw her. I would suggest you go pick her up and teach those combo players a lesson. Site News: You’ll get one more post before the ROE Prerelease (I encourage you to go if you weren’t planning to already), then the big ROE EDH set review. 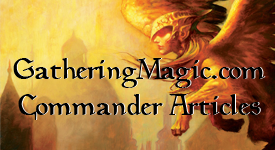 Also, I’m in the process of showing all of your requests for EDH deck clinics to some of the other writers on this site since they’ve shown interested in helping out as well. We’ll get to some of your decklists in the next couple of weeks. This entry was posted on Tuesday, April 13th, 2010 at 11:28 pm	and tagged with Livala Keeper of Silence and posted in EDH, Magic: the Gathering, Rise of the Eldrazi. You can follow any responses to this entry through the RSS 2.0 feed. The part that really sets the tone is “creatures your opponents control”. You still get all your activated abilities. ARGH! In reality, I predict Linvala will not be a problem. She will be a lightning rod every time she comes into play, and since she doesn’t actually stop anyone from casting spells it will be easy to get rid of her. Definitely not as annoying as Iona in EDH multiplayer. Actually you can accomplish the land lock-down with her as the general. All you need is Kormus Bell, an Urborg in play (which you CAN play in mono-white) and the general in play to lock everyone out of the game. There you go, you can be a jerk in EDH. Who knew? Actually, that’s a pretty funny idea. And Karma so everyone dies gloriously!